JANTAR MANTAR - This is the largest and the best preserved of the five observatories built by Jai Singh II in different parts of the country. This observatory consisting of outsized astronomical instruments is still in use. Night stay in Jaipur. Morning after breakfast proceed for excursion to Amber Fort. Elephant ride ascent to the fort. AMBER FORT PALACE - Amber is the classic romantic Rajasthani fort palace. Its construction was started by Man Singh I in 1592, and completed by his descendent Jai Singh I. Its forbidding exterior belies an inner paradise where a beautiful fusion of Mughal and Hindu styles finds its ultimate expression. Continue sightseeing. BIRLA TEMPLE - Situated in the south of Jaipur, Laxmi Narayan Temple is one of the many such temples built by wealthy Birla family in India, thus it is also known as Birla Mandir. The temple is a great reminder of the secular traditions India has shown over the centuries. The temple has been constructed in white marble and has three domes, each portraying the different approaches to religion. The temple is situated at the foot of Moti Doongri Fort, converted as a small palace by Ram Singh II for his wife Gayatri Devi. Night stay in Jaipur. Morning after breakfast and drive to Pushkar on the way visit Ajmer. The famous Dargah of Sufi Saint Hazrat Khwaja Moinuddin Hasan Chisti. The shrine is next only to Mecca or Median for the Muslims of south Asia. Akbar used to make a pilgrimage to the Dargah from Agra once a year. After visiting continue drive to Pushkar. Arrive Pushkar and check-in at the hotel. Night stay in Pushkar. Morning after breakfast proceed for city sightseeing tour of Pushkar. Pushkar boasts temples, though few are as ancient as you might expect at such an important pilgrimage site, since many were deserted by Aurangzeb and subsequently rebuilt. The most famous is the Brahma Temple, said to be one of the few temples in the world dedicated to this deity. It's marked by red spire, and over the entrance gateway is the hans, or goose symbol, of Brahma, who is said to have personally chosen Pushkar as its site. Night stay in Pushkar. After breakfast and drive to Udaipur. Arrive Udaipur and check-in at the hotel. Rest of the day at leisure. Night stay in Udaipur. Morning after breakfast proceed for city sightseeing tour of Udaipur visiting the city is built in 1559. 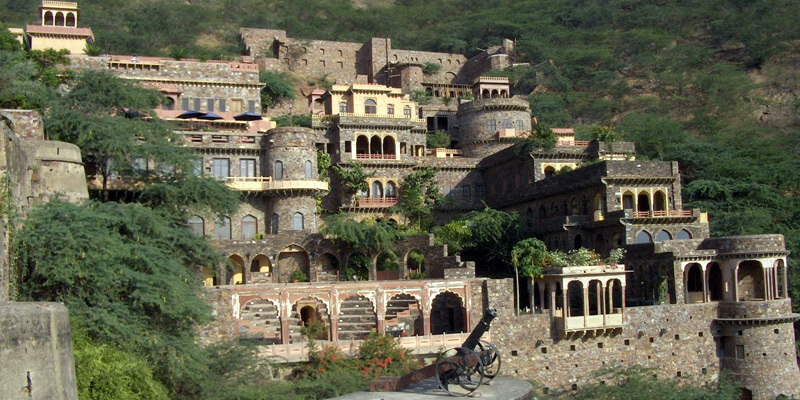 A.D. by Maharaja Udai Singh and has been described the most romantic spot on the continent of India by Col. James Todd. Visit the city Palace Museum, the Jagdish temple, Sahelion ki Bari (Queen’s resort for their friends) Bhartiya Lok Kala Mandir (Folk Art Museum) and the Pratap Memorial. Also enjoy Boat ride at Lake Pichola. Night stay at Udaipur. DILWARA JAIN TEMPLE – These remarkable Jain temples are Mount Abu's main attraction and among the finest examples includes two temples in which the art of carving marble reached unsurpassed heights. HOUSE OF ELEPHANTS - House of Elephants', with figures of elephants marching in procession to the temple entrance. The later ' Tejpal temple ' is dedicated to Neminath, the 22nd tirthankar, and was built in 1230 by the brothers Tejpal and Vastupal. The carving is so fine that, in places, the marble becomes almost transparent. NIKKI LAKE – Nakki Lake is virtually in the heart of Mount Abu and is a big attraction with tourists. The lake takes its name from the legend that it was scooped out by a god, using only his nails, or nakh. It's a pleasant stroll around the lake - look for the strange rock formations. On the lake there is a dilapidated concrete boat-shaped snack bar. Night stay in Mt. Abu. Morning after breakfast drive to Jodhpur en-route visit Ranakpur. Visit world famous Jain Temple Ranakpur. The exceptionally beautiful Ranakpur complex is one of the largest and most important Jain temple in India. The main temple is the Chaumukha temple, or Four Faced Temple, dedicated to Adhinath. Built in 1439, this huge, superbly crafted and well-kept marble temple has 29 halls supported by 1444 pillars, no two alike. After visiting continue drive to Jodhpur. Arrive Jodhpur and check-in at the hotel. Night stay in Jodhpur. Morning after breakfast proceed for city sightseeing tour of Jodhpur. Mehrangarh Fort, the original fort was constructed by Rao Jodha in 1459 after whom the city has been named. See the cenotaph Chattri of Kiratsingh Sodha, Jayapol, Fatehpol, Lohapol, Phool mahal, Zhanki mahal, moti mahal and a museum in the fort which has interesting artifacts. Jaswant Thad, Umaid Bhawan Palace and Clock Tower. Night stay in Jodhpur. Morning after breakfast and drive to Jaisalmer. Arrive Jaisalmer & check in at the hotel. Later proceed for city sightseeing tour of Jaisalmer visiting the burnished sandstone Jaisalmer, Throbbing in the heart of the Thar, is an intricately molded wonderland in place of a barren land, today stands a city of gilded magic. The origins of Jaisalmer go back to the 12th century, when Rawal Jaisal abandoned his old fort at Ludarwa and laid the foundation of a new city. Visit the magnificent fort, the Patwon Ki Haveli (Mansion) and Salim Singh Ki Haveli, with their carved balconies and brackets, which are supreme examples of the art. Evening enjoy camel ride – along with culture program and Dinner. Night stay in Jaisalmer. Morning after breakfast and drive to Bikaner. Arrive Bikaner & check-in at the hotel. Later proceed for city sightseeing tour of Bikaner. Bikaner is named after its founder Rao Bika Ji in 1488. But long before this, the city was trade center on the caravan routes from Africa and West Asia. Bikaner's dominant features are rippling sands and abundant sunshine. The city stands on an elevation, enclosed by a 7 Kms wall, which can be entered from 5 gates. Bikaner City is bolstered by imposing walls and has a 16th century fort housing old palaces, temples and mosque. Founded by Raja Rai Singh the fort is distinguished by its long range of 37 pavilions, a line of balconies and aerial windows of varying designs. Also visit Lallgarh Palace, the museum, and Bhanda Sagar Jain and Deshnoke Rat temple. Night stay in Bikaner. Morning after breakfast and drive to Mandawa. Arrive Mandawa and check-in at the hotel. Later proceed for sightseeing tour of Mandawa, founded 1755 by Thakur Nawal Singh and still the home of his descendants has beautiful frescoes, Havelis and mansions. Mandawa castle one of the finest castles of Rajasthan, is now a hotel and house of collection of armories, costumes of ancestors, canons from 1820 ancient coins, numismatic collection and many other interesting items, preserved in a museum. Night stay in Mandawa. Morning after breakfast and drive to Bharatpur. Arrive Bharatpur and check-in at the hotel. Later visit Bharatpur Bird Sanctuary on rickshaws. The most Spectacular water- bird Sanctuary features nesting indigenous water- birds and migratory birds. From October till December, the indigenous water- birds nest around the lake, from December on the migratory Geese, Duck and Cranes are the main feature of the bird sanctuary. Night stay in Bharatpur. Morning after breakfast and drive to Agra. Arrive Agra and check-in at the hotel. Later proceed for city sightseeing tour of Agra the home of the immortal Taj Mahal, the inimitable poem in white marble is the first expression of love of an Emperor Shahjahan for his queen Mumtaz Mahal. This great monument was completed in 1653 AD. Agra Fort, the imposing structure on the banks of the river Yamuna is replete with priceless examples of craftsmanship in the Mughal period, including the beautiful pearl Mosque; it was designed and built by Emperor Akbar in 1565 AD. Night stay in Agra. Morning after breakfast and drive to Delhi. Arrive Delhi and departure transfer to the airport to board the flight for onward journey. Tour ends with sweets memories.